History indicates that our Indigenous ancestors had elders who were groomed in the healing arts. These individuals would serve as herbalists, healers and spiritual communicators. The Healer Tea is created to honor those people for their efforts and sacrifices. This blend promotes a healthy immune system and supports respiratory and nasal health. Directions: This is a two step process. Step one: Shake the jar, remove the lid and smell the aroma. The scent of this blend may make you cough and sneeze. Afterwards, proceed to step two: Put 1 Tsp of The Healer in a tea infuser and place in a cup of boiling water. Allow tea to steep for 5 minutes, then enjoy. Unusual Uses for The Healer: We have been told that people add The Healer to chicken soup, to V8 juice, to chili, and even to Dr. Pepper. Caution: Consult your health care professional prior to use if you are pregnant, nursing, take any medication or have a medical condition. 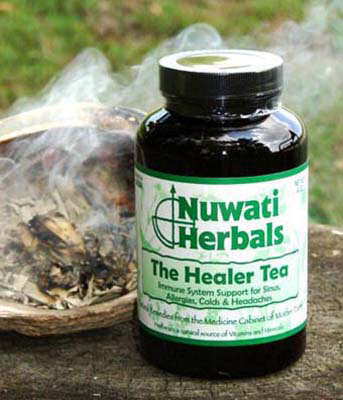 Made by Nuwati Herbals in the U.S.A.